The Illinois Senate approved a bill 40-14 on Tuesday that would replace criminal penalties with a civil fine for possession of a personal amount of marijuana. It will now go to the House for further consideration. 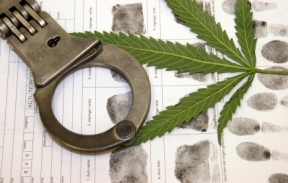 SB 2228, introduced by Sen. Heather Steans (D-Chicago), would make possession of up to 10 grams of marijuana a civil violation punishable by a fine of $100-$200. Adults would no longer face time in jail, and the civil offense would be automatically expunged in order to prevent a permanent criminal record. The proposal largely mirrors legislation introduced in the House by Rep. Kelly Cassidy and reflects amendments Gov. Bruce Rauner proposed when he vetoed a similar bill last year. Under current Illinois law, possession of up to 2.5 grams of marijuana is a class C misdemeanor punishable by up to 30 days in jail and/or a fine of up to $1,500; possession of 2.5-10 grams is a class B misdemeanor punishable by up to six months in jail and/or a fine of up to $1,500; and possession of more than 10 grams up to 30 grams is a class 4 felony punishable by up to one year in jail and/or a $1,500 fine. More than 100 Illinois communities have already removed criminal penalties for simple marijuana possession. Twenty states and the District of Columbia have removed the threat of jail time for simple marijuana possession.